More accurately the Pokémon Mega Construx are coming, as Nintendo’s pocket monsters become the latest license to join Mattel’s recently re-branded line of construction toy sets. Anything is better than Ionix. Pokémon is one of the most desirable toy licenses out there, and now Mattel has the construction toy segment of that license locked up. 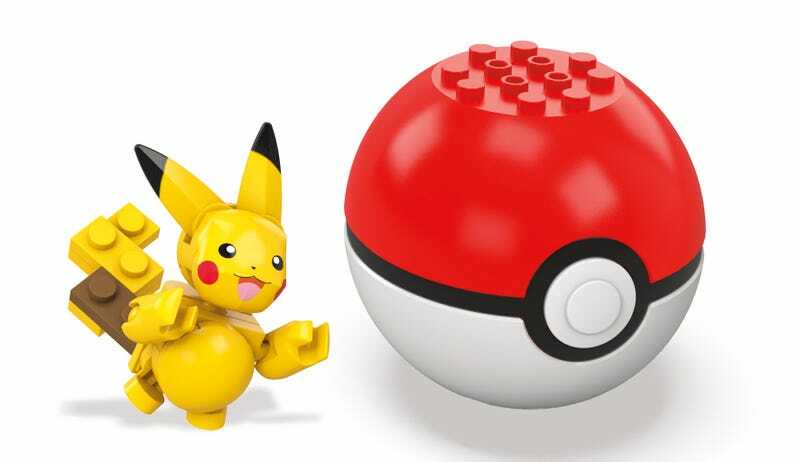 Mega Construx Pokémon sets will start hitting North American stores this summer, featuring battle-ready figures of Pikachu, Charizard and others from the Kanto region. Mega Brands recently split their Mega Bloks line in two, leaving the Bloks label on toys aimed at small children and swapping Contrux in for its preteen to adult collector line. The Pokémon should come as no surprise to toy collectors following the Japanese scene, where Bandai has been releasing Pokémon Mega Bloks sets since last year. Pokémon Mega Construx sets will be on display at Toy Fair 2017 in New York starting this weekend, as will I, so be on the lookout for more on the line soon.